120 x 95 mm. – 193 leaves. With 12 full-page miniatures, the majority painted, but some pen and wash drawings. This Book of Hours is a remarkable, rare Austrian manuscript with miniatures and pen and wash drawings by presumably two different hands. The twelve full-page, painted miniatures and pen-and-wash drawings of our Book of Hours are arranged, quite unusually, in pairs on recto and verso. The drawings can be attributed to two different hands. St. Florian seems to be by a more secure and elegant hand compared to the Nativity and the Confession scene. The iconography in this Book of Hours is interesting and unusual. Although the Annunciation is at the beginning of the Hours of the Virgin, it precedes the text, while the Nativity is on the verso facing the beginning. 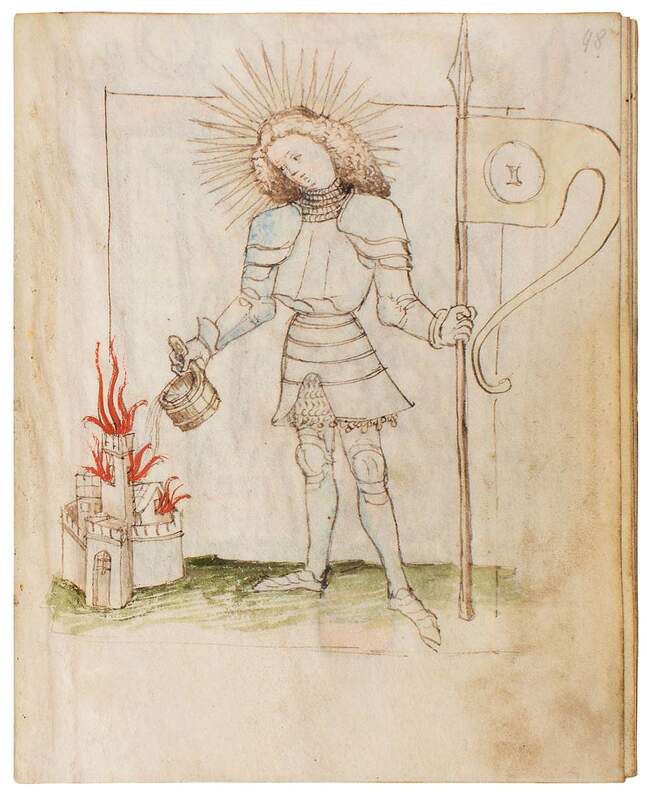 The prayers to the instruments of the Passion of Christ are introduced by two elegantly coloured pen-drawings: a miniature of St. Florian and one of Christ as Man of Sorrows with Arma Christi. St. Florian, in contemporary armor and with banners, empties a small wooden tub filled with water on a burning city, drawn next to his feet. St. Florian is one of the most important Austrian saints and was called upon to protect against water and fire.